I blog about my jewelry inspirations. Readers will find that various elements of nature are my inspirations. 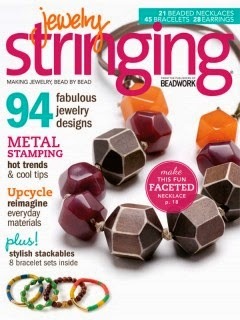 Of course, I include jewelry making tips. 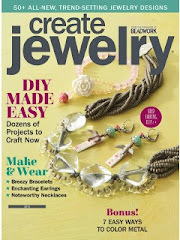 This blog also includes some of my favorite Etsy shops, bead shops and jewelry customers. 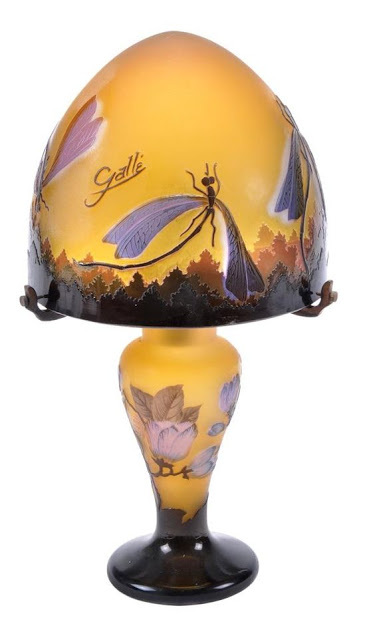 October's Art Bead Scene Challenge is "Dragonfly Lamp" By Émile Gallé. 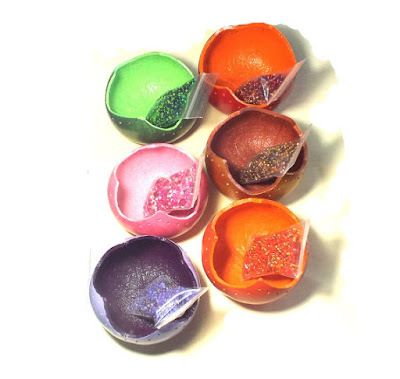 It is cameo glass which is a luxury form of glass art produced by etching and carving through fused layers of differently colored glass to produce designs, usually with white opaque glass figures and motifs on a dark-colored background. Émile Gallé (8 May 1846 – 23 September 1904) was a French artist who worked in glass, and is considered to be one of the major forces in the French Art Nouveau movement. revitalized the glass industry by establishing a workshop to mass-produce his, and other artists', designs. The factory would employ 300 workers and artisans at its height and remained in operation until 1936. This month's art has many different elements that can be used for inspiration: dragonfly imagery, trees, movement, wings, insects, leaves, tulips, glass, light. The colors are a gorgeous complimentary color palette of golden yellow and shades of lilac and lavender rounded out with rusty burnt sienna and raw umber. I love the dragonfly motif. I have found it to be very popular in jewelry so I selected the dragonfly as my inspiration. The motif brought to mind Heather Power's course "Cane Design Bootcamp" to mind. I am slowly working my way through it. 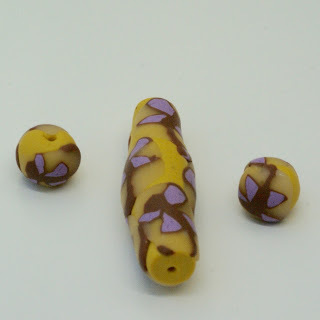 Even though I just finished Week 2 of it, I have viewed all of the videos for the entire course a number of times and I remembered that this course had a few ways to put the dragonfly motif on polymer clay beads. I selected the method in week 2 of creating a polymer clay cane of a tiny dragonfly because it looked to be the easiest and I love to be successful. The 3 beads that I photographed are the only ones that I choose to share because they are sadly my best. Making polymer clay beads is a struggle for me. First there is the conditioning of the clay. I have gotten to the point that it is no longer a huge ordeal. I devote 1 day to that. I am pretty pleased by my lavender that I mixed. I used a pinch of white, silver, and mostly purple to get a color that I think matches well to the art. The yellow I made isn't as deep and bright as the yellow in the lamp. At the time I made it, I thought is was. I think I nailed the brown when mixing the clay. Day 2 was devoted to making the base beads which were all yellow. This process included putting the holes in the beads. I am pleased that I am getting better at putting a whole through a tube bead. My base beads all turned out well so I see improvement here. Day 3 was devoted to making the dragonfly cane. I got pretty close on my third attempt at making the cane. I think you can recognize my dragonflies are dragonflies. My major problem is that when I used transparent clay, I hoped that the yellow would show through better than it did. You really can see the transparent clay sitting on the yellow beads. Perhaps, I should have used matching yellow polymer clay or cut my canes thinner and blended the clay in better. Heather really has a talent in those hands of hers. On the videos you can see how natural and easy it is for her to whip up beads and canes. I would love to know how many beads she can make in a day. I bet it is more than I could ever imagine. I just wish that I could end up with a few really nice beads after 3 days of labor. Oh well, I just need to practice more and more! I also need to finish my course. Thank you Heather for sharing your talent and beads! Since the weather has been all over the news for a lot of the month of October 2016, it seemed that it might be a good inspiration for this month's We're All Ears challenge. So our challenge is the weather... wind patterns, cloud formations, precipitation... whatever we would like to represent! I selected clouds for my specific inspiration. 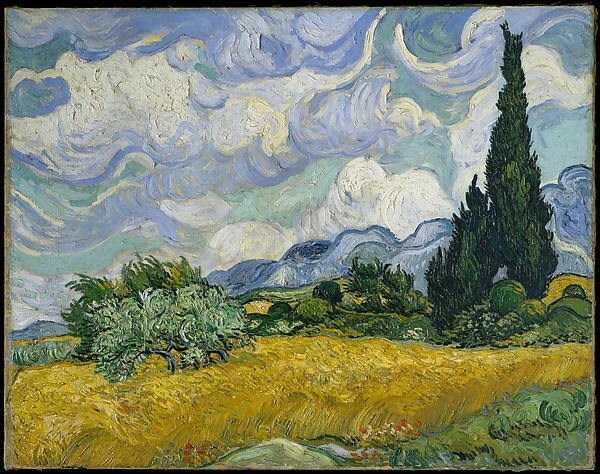 The blues, greens and whites in clouds of the Van Gogh painting were the inspiration for my pair of pale blue earrings. 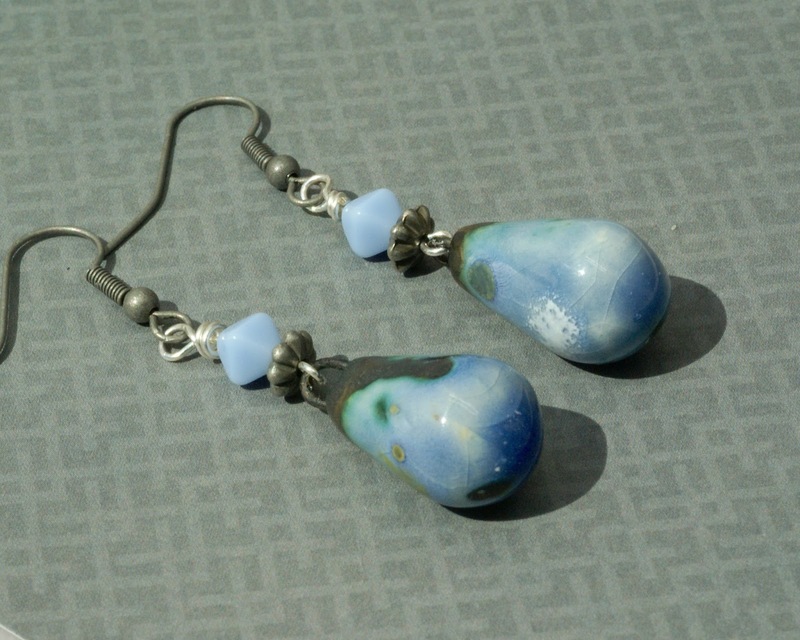 These modern blue earrings are made with handmade artisan Ming porcelain beads by artisan Scorched Earth. Gunmetal ear wires and beads are used to compliment the gray in the pastel blue beads. There are also little pops of green in this light blue jewelry. I love the rustic look of these handmade boho earrings. The long earrings are light and comfortable to wear and measure 2 inches in length. 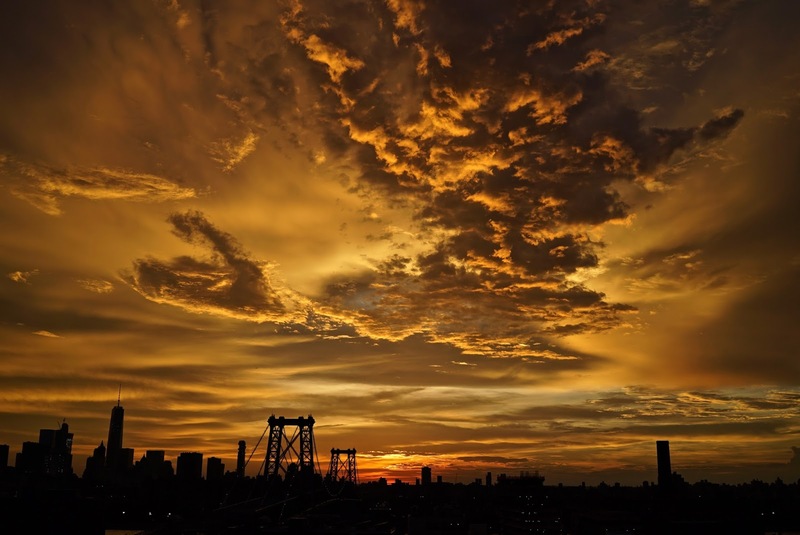 I focused on the browns, beiges, whites and swirls in the clouds of this dramatic photo for my next pair of earrings. These textured brown ceramic earrings are earthy and rustic. The brown ceramics and jasper beads dangle below natural brass ear wires. The beige and brown earrings have natural brass ear wires that go great with brown and beige of the ceramics and jasper beads with a hint of orange. The artisan ceramics are made by Marsha Neal Studio. I spent some time recently in Montana and I enjoyed the magnificent scenery and pristine environment. The sky there is often a brilliant blue that you rarely if ever see on the east coast or near any major urban center. Sometimes I forget how blue the sky can look especially when there are white puffy clouds for contrast. 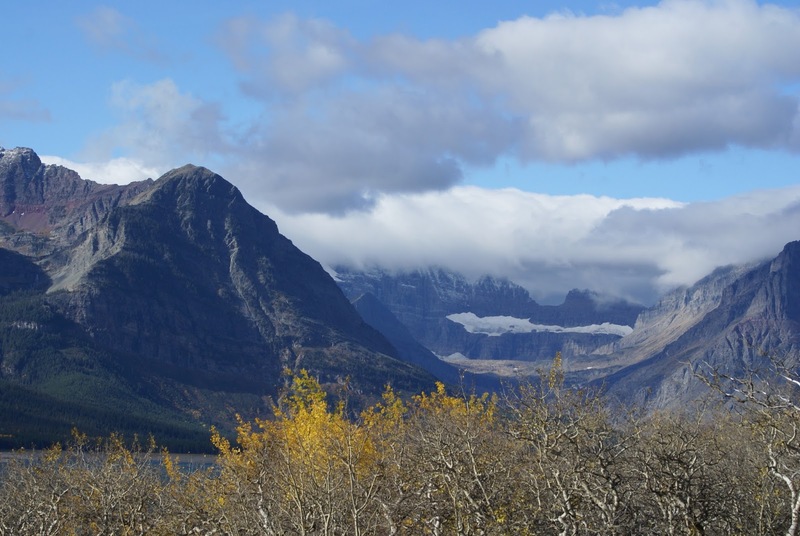 At Glacier National Park, the white of the glaciers also highlights how blue the sky is. 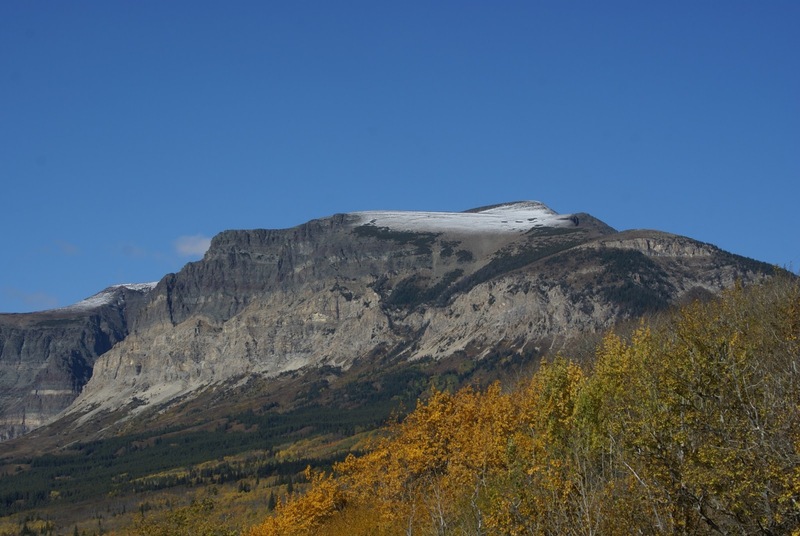 Weather can change quickly in the mountains. In some parts of the park, we were so high up in elevation that we drove through the clouds. One day we drove through light rain, light snow, and fog. 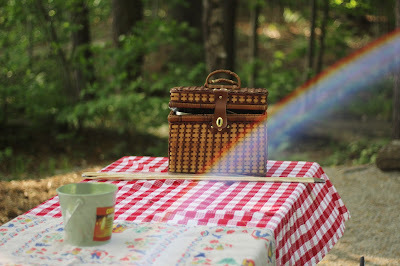 We were rewarded with this gorgeous rainbow! I came away from this trip with lots of inspiration from the weather, clouds, and wind. 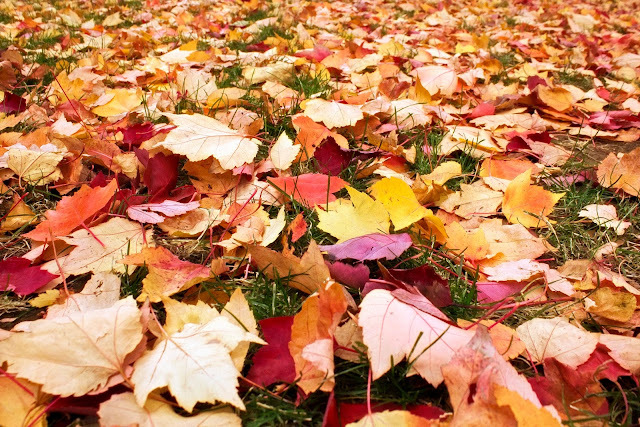 I am amazed at how fast October is flying by. Can you believe it’s already halfway over? 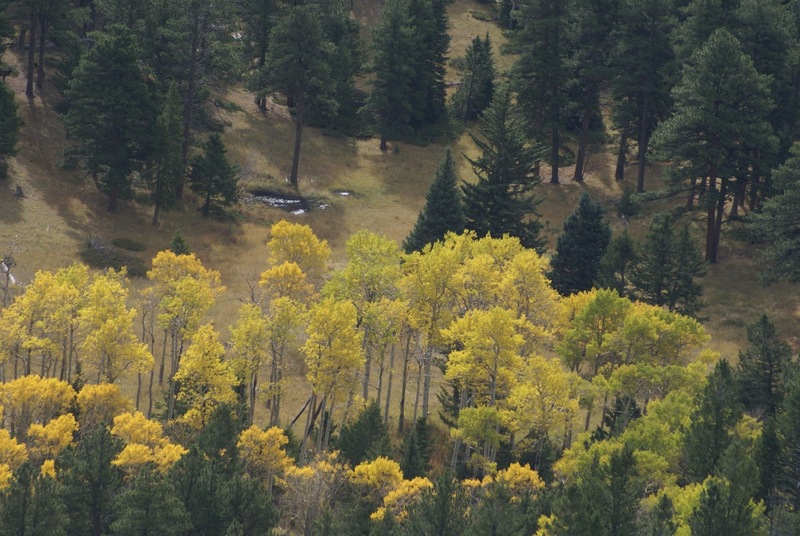 Autumn is one of my favorite seasons of the year, and I’m trying to enjoy every minute of fall while I can. 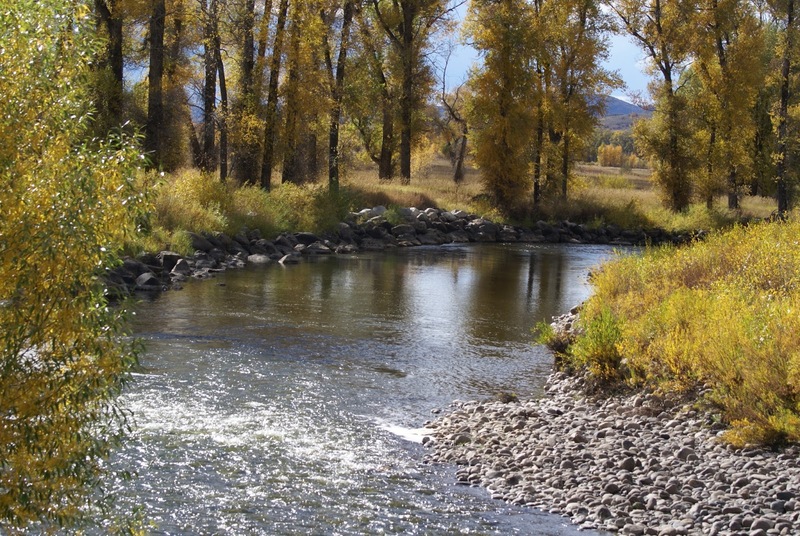 I hope you have a happy weekend and enjoy a few of my fall favorites. These textured brown ceramic earrings are earthy and rustic -- qualities of fall. The brown ceramics and jasper beads dangle below natural brass ear wires. They are light and comfortable to wear. 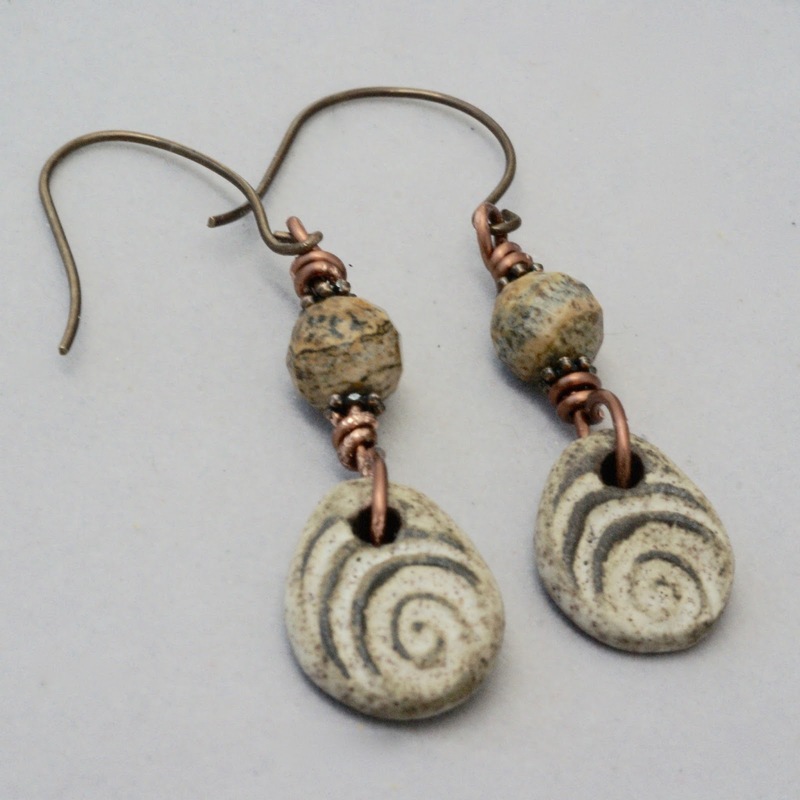 The earrings have natural brass ear wires that go great with brown and beige of the ceramics and jasper beads. The artisan ceramics are made by Marsha Neal Studio. Fall is a time to show argyle. 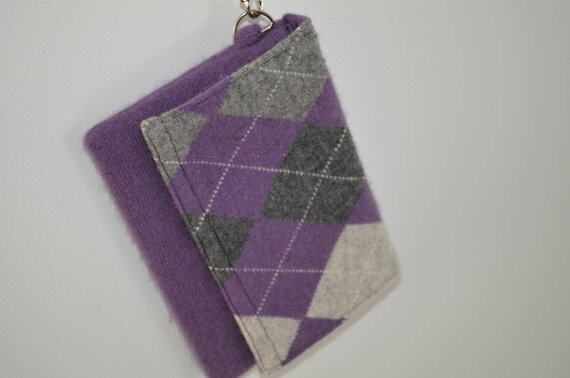 This pretty little clutch by TwiceNicePurses is made from a very soft repurposed sweater. The gray argyle design is a nice contrast with the light purple. There is a pocket inside, a magnetic snap and a handle that can be easily attached and detached. Thanksgiving is my favorite fall holiday because it is a time when my family gathers together from different parts of the country to celebrate what we are most thankful for and to enjoy a meal together. 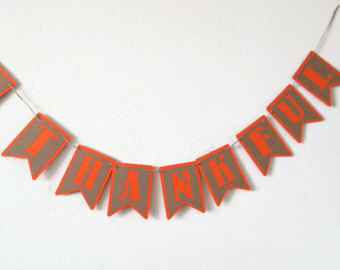 This Be Thankful Banner! by ShopatLilys will be strung across our fireplace mantle. This banner is made using orange and kraft paper cardstock. Each pennant measures 5" by 3.75" and has been strung using jute twine. How are you getting into the fall spirit? I’d love to hear your thoughts in the comments! These fern earrings are made from natural brass sheets that have been embossed with a fern pattern. 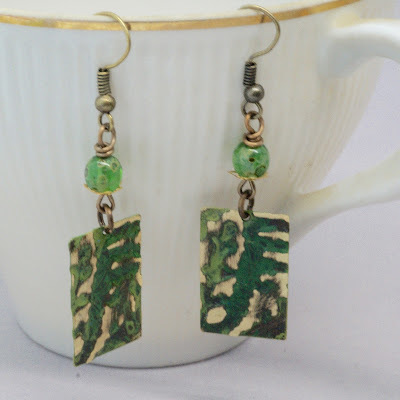 love the look of the greens in these green leaf earrings. 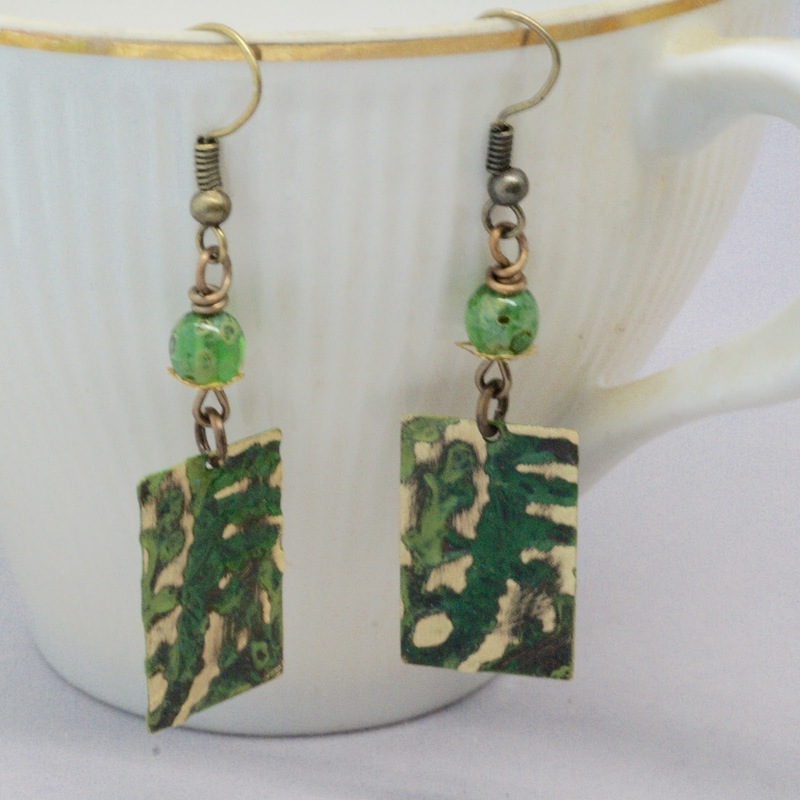 The green earrings are hand painted with patinas to created this fern jewelry. 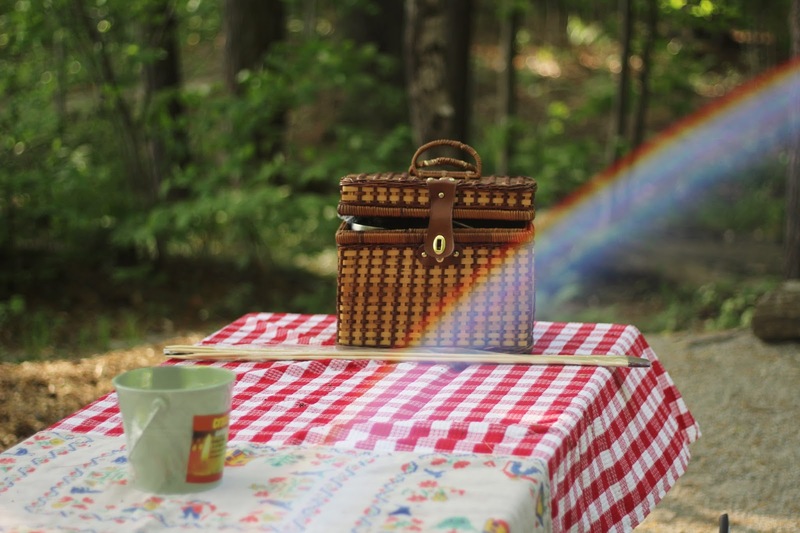 The metal has a protective coating to keep the color vivid for years to come! I have hung them on brass ear wires and added green beads at the top. Natural brass ear wires add to the earthy look. This leaf jewelry is nature inspired and are perfect casual green earrings. These green leaf earrings are a perfect gift for the outdoors lover. 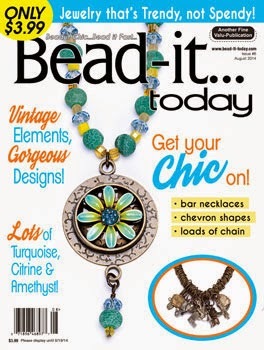 This sparkling beaded craft project called Peaks and Valleys, was developed by Lynn aka Midnightcoler and taught at the NC Basketmakers Convention in March of 2016. You'll learn to bead coil a zig zag rim to crown this vibrant gourd bowl, then add sparkling accents to complete it. It starts with an organically grown prepared gourd from Lynn's garden. 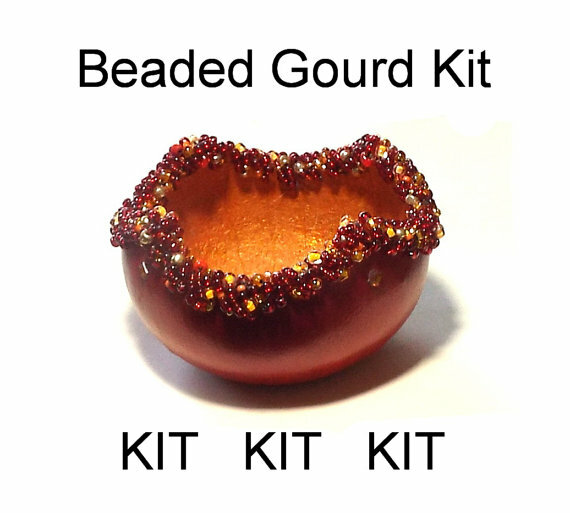 Kit includes a prepared organically grown gourd (approx 3 1/2 - 4 1/2" or so, sizes vary a bit,) coordinating bead mix, thread, beading needle, bead stops, gems, complete instructions. An enjoyable, relaxing project. Project takes approximately from 5 to 7 hours, with most completing it in around 6 hours. 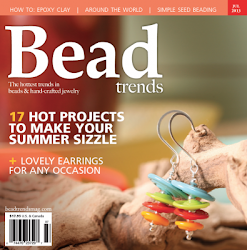 This project is easy, and is for all levels, from beginner to experienced beaders. It's suitable for adults or for some older children who can handle a beading needle and scissors. I love this artificial eucalyptus wreath in lovely orange and yellow. 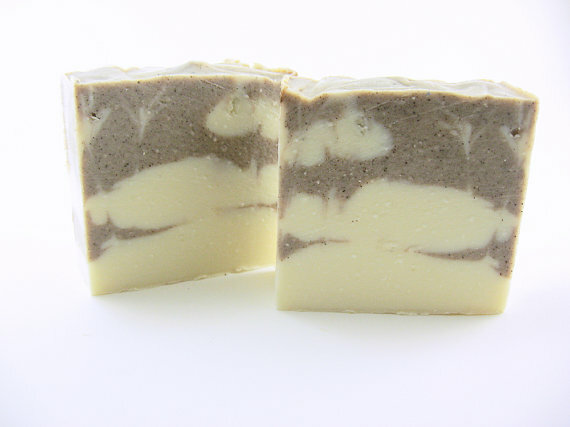 The artificial eucalyptus used is soft, light & airy, and not heavy at all. The wreath is made on a 24" x 24" grapevine twig base so the finished piece measures about 24" x 24". 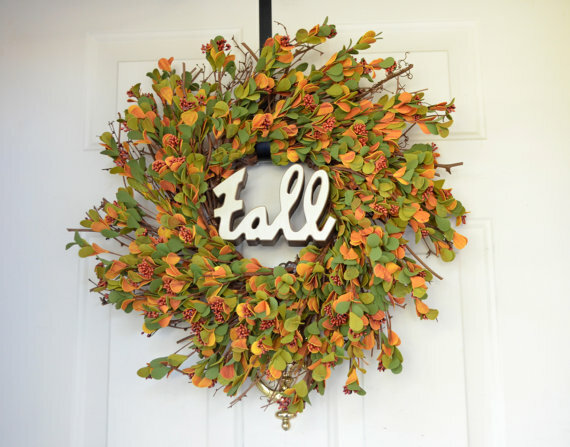 Wired on the center front of the wreath is a "fall" word sign. There is a wire attached on the back of the wreath for hanging. 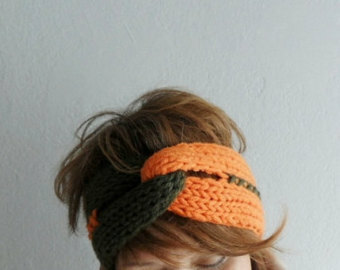 This orange and green headband by fizzaccessory is knitted in the two colors and embellished with cross stitch. It is a unique design and a perfect accessory for cold weather. It keeps your head and ears warm. It is hand knitted with soft high quality wool acrylic mix yarn. Isn't this perfect for fall holidays! 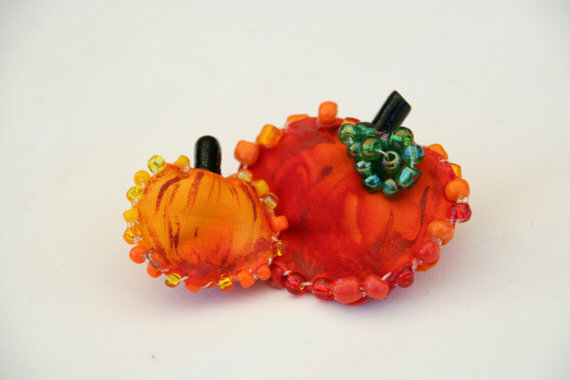 This unique, hand crafted pumpkin pin by PaintFabricWhimsey features quilt quality cotton fabric with hand beaded leaf and coordinating orange glass beads sewn around the edge. A touch of paint here and there has been added for emphasis. This pin features two adorable little pumpkins side by side. This pin is mounted on a small 1" metal bar pin. 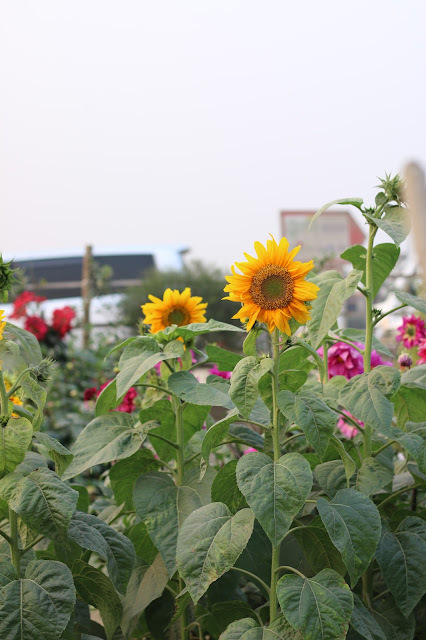 It measures approximately 1 1/2" x 2 1/2", which includes the stem. Are you feeling the love yet? I can’t wait to hear which of these is your favorite! Click Here to see my collection of jewelry and handmadegreeting cards . 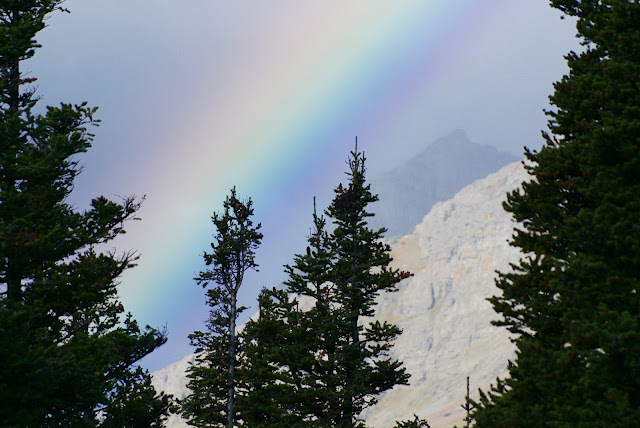 All content and images on this blog are owned by Kathy Lindemer. Simple theme. Powered by Blogger.